How are we to describe the nature of that which functions through a performance of invisibility? How are we to ask questions of a system that, through its very purpose, oftentimes fools us into thinking that it is all but absent? I write to you here of digital media–of video and binary–of items which catalogue, reconstitute and fake their nonexistence as to silently confer upon us that which they represent, alone. This representative burden has been approached by others under the name ‘apparatus’ and spoken about in the academy–still, many artists seem too interested in keeping the technical archive silent in their work. Notable exception can be seen in avant-garde filmmaking, those celluloid scientists who scratched and warped and, through a process of their own hands, reminded us that cinema was a medium and not just a vehicle. The concepts of glitching owe a great deal of gratitude to this dense work and the ideology it embodied. However, as film is overtaken by the exponential proliferation of digital media–mediums predicated on computational binary and coded systems of memory, rather than physical material–we seem to be once again lost in a sea of representation trying to find birth in the understanding of that which carries us on. So we return to the experimental work of our predecessors in an attempt to determine how we are to make a hand-processed video, one that might incorporate the narrative of the medium into the discourse of the piece as a functioning whole. All digital media exists as delineated pieces of language. One could interpret a selection of Flash video or a digital still as a container for zeroes and ones. Binary, that mythological, universal language of the invisible apparatus, one that would fool us into thinking that it is nebulous and untranslatable. It tricks us into believing that when we “export” or “save as” we are engaging in a type of alchemy–but of course these processes are just retranslations and reinterpretations. Binary is a language just as any invented by society and if we take language to be a system of exteriorized and codified thought, then glitching might be seen as the deconstructive linguistics of computer languages. Glitching represents an attempt to understand the liminality between translation and interpretation though methodical alteration and systematic intervention of digital archives. 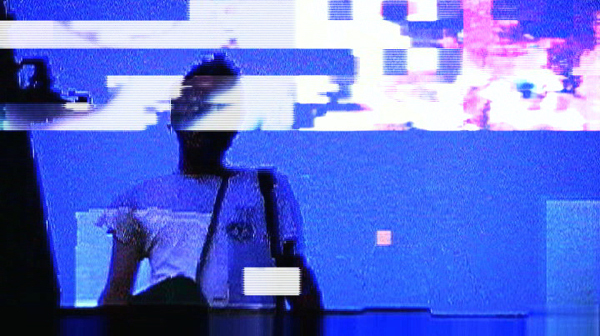 Returning to the handmade films of the previous generation, we are able to glean another meaning for use with the glitching paradigm. Oftentimes, these hand-processed works assumed the look of a rapidly aged filmstrip. An abundance of scratching, the fading of the stock itself and an imperfect expression of color all became incorporated into the lexicon of DIY chemical processing. Still these visual and auditory representations were emblematic of the natural process of time’s intervention with the medium. The scratches from a hand-processed piece may have shown up there over time due to wear and repeated viewings. Glitching, not surprisingly, has a similar chronologic approximation. Everything on our hard drives is slowly forgetting itself. Information is lost through compression and manipulation, but also through a file’s own forgetfulness. In this form of digital Alzheimer’s, a zero will forget that it is supposed to be one, and after a time the entire file structure will become untranslatable. While glitching represents an acute and purposeful manipulation of an archive’s code, it could be argued that the file would have evolved in a similar way over time. It is in this way that glitching not only represents an inception into the structures of language but also an approximation of time’s affect on a medium built in the hopes of an archival permanence, even if this hope is unfounded. Glitching is a process of creating work that raises awareness of the means by which we communicate and ultimately exteriorize thought. It is an attempt to integrate the “nebula” of video with a concrete process of interpretation and injunction, thereby incorporating the properties of a medium into the narrative of its content. At the very least, glitch-art functions as a reminder that the technology of digital production and information theory remains as an inexorable collaborator in all works of digital propagation and therefore should be treated as significant. For every file is telling a dual story, one of its accessible presentation and one which is only apparent as its internal systems, its code, becomes visible. Born in Whitestone, New York in the 1980’s and raised in the Hudson Valley, Evan Meaney has been working with film, video, and emerging media for over a decade. During that time, his interests have turned to post-structuralist archival theory, break dancing, and the poetry of hexadecimal code. Meaney currently enjoys a graduate fellowship at the University of Iowa's department of Cinema and Comparative Literature where he continues his research into the deconstructed computational languages of video codecs. He also makes wonderful hummus.